The Piha Radar Station was Unit Number 4 of the COL (Chain Overseas Low-Flying) network of coastal radar stations established around New Zealand and the Pacific during WW2. 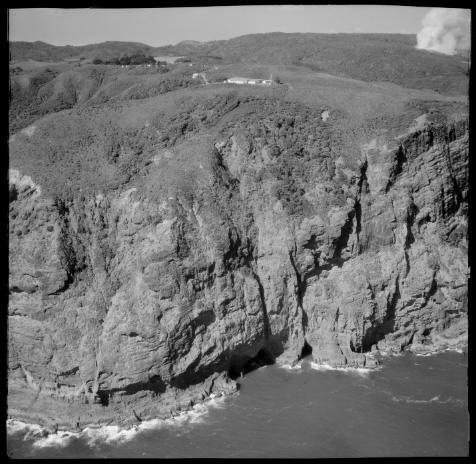 The Piha station was established between Piha and Karekare in 1942 by the air force. It was located at the end of todayâ€™s Log Race Road which was actually built to access the radar station. It was a large unit, accommodating around 50 personnel at any one time. These were the RNZAF radar mechanics who operated the radar equipment, and RNZAF and WAAF radar operators who scanned the receiver for any sign of an unexplained aircraft or vessel. There were also navy personnel looking for vessels. The unit was top secret, with a 16-strand barbed wire fence around the unit, gates with armed guards on the entry road. Personnel were not allowed to use cameras or talk even to family about their work. The revolving aerial array was positioned on a twenty foot tower on the 851 feet high cliff top. It could scan 200 miles out to sea and where an air plane or vessel was detected this appeared as an echo on the receiver. The radar unit operated throughout the war, and after the war it was used for training of territorials and armed forces personnel. Closure came finally inÂ the later 1950sÂ at which time the buildings were moved off site and taken to various locations for the air force, except for one building which was taken to the Piha Domain campground to serve as the cookhouse.